I was having lunch with an old colleague and former partner, Cheryl Vandemore, yesterday and we were talking about ways to market yourself or your business when you’ve got zip to do it. Let’s face it, most small businesses are in this position. You know you’re supposed to market yourself but it’s everything you can do to just keep operating, much less advertise. She was telling me about her new hair stylist, a young woman who takes her profession and her business quite seriously. Shortly after Cheryl’s first appointment, she received an e-mail thanking her personally for the business and with a attachment of three photographs of different hairstyles that the stylist felt might be a good look for her. She invited Cheryl to look at them, think them over, and then call to talk about them. So Cheryl picked one, called her up and made her next appointment. She said she was excited about the new look. But she was also impressed with how this young entrepreneur had reached out to a new customer to cement the relationship. The stylist, in effect, sent Cheryl a little gift, a free consultation. She let her know that she was thinking about her and how she could help her. This is damn good marketing. 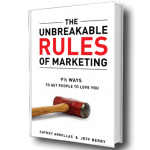 It obeys all 9 Unbreakable Rules of Marketing at once; consistency, perception control, creativity, message management, simplicity, giving love, emotionality, effort, and integration. And all she had was her cell phone. Contrast this with other service businesses who, in the interests of improving their customer relationship management (CRM), invite you to go to a website and fill out a customer service survey. The implication is (and sometimes it’s not even an implication; it’s made quite clear by the employee who writes her name on the receipt) that if you don’t give them a perfect 10, heads will roll. How does this make you feel? Suddenly, someone’s job is in your hands. You’re not thinking honestly about your actual impression, you’re just thinking these guys terrorize their employees. And you’re thinking also that they just want to capture your data for their automated CRM database. And does anybody take these stupid surveys seriously? Is this supposed to be what passes for marketing metrics? Is anybody suspicious that so many perfect 10s come back? But, getting back to the example of Cheryl’s stylist, she had the right idea about marketing: Make it simple. Make it personal. Make it useful. And show you really do care about their repeat business. Also, don’t make anybody feel sorry for you. It isn’t about you; it’s about your customer. Not everybody likes to write. This post is not for professional copywriters, or professional writers (copy or otherwise). You guys can go about your business. The points I’m going to make here are for the normal 99.99% of people who hate to write, who equate writing with their worst days in school, who think they are bad writers, but who, nevertheless, frequently find themselves tasked with writing something–like the content for their own website, an e-mail, a white paper, a cover letter, a Dear John letter, a term paper, or even a blog post. My sympathy goes out to you. Which is why I’m being so saint-like in writing this post. So I wanted to give some little tricks you can use to overcome your aversion to writing. That’s easy for me to say, I know, because I happen to like writing. I love it, in fact. Some even think I have a syndrome somewhere in the DSM (Diagnostic and Statistical Manual of Mental Disorders) that describes my compulsion to write. But they’re nuts. The mistake that most people make when they start writing is that they write like they think the thing should sound. They imitate what other, similar pieces sound like. But what they end up doing is stringing together a series of banalities that mean nothing. They use words like “passion” and “commitment” and “solution” and “leverage” as though they were little silicon implants, packed in there to flesh out the prose. And when you read that kind of writing, your eyes glaze over. In fact, you’d better not read it while driving. But think about it. If someone were to talk to you like that in person, would you think they were crazy? Or mind-numbingly dull? Or just full of gas? Well, why would you write like that to them? If your eyes glaze over reading it, why would anyone else stay alert while they read your version of the same? So write like you talk. This doesn’t mean you should use slang, or incomplete sentences (unless for effect), or bad grammar. This doesn’t give you permission to commit the “Me-I” pronoun error. Nor can you let typos slide. But it does mean that, as you write it, the piece should sound like it’s coming from a living, breathing human being. I always tell people to imagine you’re having lunch with the person your writing to. Write that script. Some writers I know say it helps them to read what they’ve written out loud to themselves or a friend chained in their basement, to hear what it sounds like as a script. I don’t do this, of course, except in my head. But some people say it’s useful. Whatever the technique you use, keep thinking, while writing, that you are actually talking to another person. The bonus to writing like you talk, is that you’ll talk prettier, too. Besides their aversion to writing, nearly every sane person has an equal aversion to have to read bad writing. Have pity on them. They didn’t do anything to you. Why would you want to bore them to death? Think how many more people would read the user agreements to software licenses if they were written more with more empathy…or at least a with little more entertainment. Pick somebody. If you can imagine for yourself a specific person you’re talking to while you write, it will help you enormously. Even though you may be writing something for millions to read (or dozens in the case of this blog), remember that they all read it one at a time. So pick one person out and think about them. Put yourself in their place. Would you want to read what you just wrote? Then rewrite it. Speech coaches tell us, when we’re talking to a large audience, to pick out a friendly face or two in the crowd and make eye contact with them. It tends to make your speech more engaging because the eye contact is part of our social animal thing. Same goes for writing. You can’t make eye contact. But you can imagine it. 3. Put the gerunds down. They’re evil, at least in place of actual, fully tensed-out verbs. This also has to do with the rule to write like you talk. Let’s say you bring a friend to lunch with the person you’re hypothetically writing to; would you say, “Introducing Monica.”? Or would you say, “This is Monica.”? See the difference? One sentence has a subject and a predicate, the other is just stupid. But how many times do you see ads or taglines written with the stupid gerund? “Introducing the 2013 Lexus!” “Announcing a breakthrough in the war on acne!” “Leveraging Solutions for a Brighter Tomorrow”. The other problem with gerunds is that they epitomize the flattest, most passive voice. They reek of non-commitment. Generally it is better to lean toward a more active tone. It doesn’t mean you can’t ever use a passive “to be” verb. Sometimes it’s unavoidable (like in this very sentence). But just try to keep up and moving around. It’ll do wonders for your circulation. So lay off the -ing verbs. My mom, who was a wizard in the kitchen, used to say that if you want be a good cook, you have to know what good food tastes like. The same applies to writing. Just immersing yourself in good literature can, by osmosis, improve your own output. The sound of language itself is musical. It’s often inspirational. The perfect word, a well-turned phrase, a memorable line are delights in themselves. If you read good writing, then, or hear it in movies or speeches, then your brain will start to imitate it, just like it sought to imitate the “commitment to excellent solutions” kind of writing before. Reading junky writing is like eating junk food. The output (and your arteries) will suffer. 5. Watch the bangs, buster! This is a special pet peeve of mine (and many of you already tease me like the playground nerd I am), but please, please, please, think several times before you put an exclamation mark at the end of your sentence. It doesn’t make it any more urgent. Or exciting. A bang doesn’t make up for a bad sentence anymore than Cool-Whip makes a stale cake better. There are some who end every sentence with an exclamation mark. But, using the empathy rule above, don’t you see what this does? It comes across as yelling. And who likes to be yelled out? Okay, so you’re excited about the big news. Putting a ! on the end isn’t going to convey that excitement any more. One of my first mentors when I was learning to write used to say that you should never use an exclamation mark unless somebody’s life was in danger. This is an exaggeration, of course. There are plenty of appropriate applications of bangs–“I’m going to be a father!” “Turn that racket down!” “The basement is flooded!”–but if you just shoot one off at the end of every sentence, regardless of content, you’re going to be out of bangs when something really important happens. Challenge yourself. If you feel tempted, out of habit, to bang the end of a sentence you’ve written because you aren’t confident it conveys intensity, rewrite the sentence. After enough practice, you’ll wean yourself from bangs. Unless you really need them. I mean, really. 6. Strip out the extraneous, fluffy, superfluous, inessential, excessive, redundant, useless adjectives. Some people seem to think that adding more adjectives to a noun will somehow bring the noun to life–like increasing voltage on the monster. Lawyers, in particular, seem to be adjective junkies. But look at any website and count the adjectives they don’t really need. Now look at yours. But if you feel tempted to add them, think what would be lost if they were gone. Which, gets to me to practice. As with any skill, the more you practice writing, the better you’ll be at it. Think of any opportunity at the keyboard as a drill in honing your craft. You can even take time to write a better e-mail, a more thoughtful Facebook post, a text. Write poetry for yourself. Write short stories. Write essays. Set up a blog. Nobody has to read it. But you’ll become a much better writer. That is, if you want to be. Or, you can always hire people like me.